As the winter draws near, the cold days always evoke memories of my childhood growing up in North-western China. Today’s recipe, Pork wonton soup (猪肉馄饨), was a special treat which I very much enjoyed in a tiny state-run restaurant near my primary school. The perfect pork wonton filling should be flavoursome and moist. Spring onion and ginger are two essential ingredients for almost all types of meat based Chinese dumplings. Chop them very small as this will help to combine them with the minced pork. Add some good quality light soy sauce for a “umami” taste (Xian Wei, 鲜味) together with some ground Sichuan pepper (or Chinese five-spice powder) for a subtle tangy flavour. Although ready-to-use minced meat is widely available nowadays, many Chinese home cooks still prefer mincing with a cleaver as they believe the hand-minced meat is more tender and retains more moisture. It’s a noisy, labour intensive job but the final result makes you feel it’s all worth it. To achieve a similar texture using shop-bought minced pork, please remember a very important step: add some stock (or water) little by little to the mince while swirling constantly in the same direction. When all the liquid is completely absorbed, the mince will be very moist and sticky. Then you are ready to assemble the wontons. I always keep frozen wonton wrappers in my freezer. They come in handy whenever I crave dumplings but haven’t got enough time to prepare the wrappers from scratch. I leave frozen wrappers in the fridge to thaw overnight and gently separate each wrapper right before assembling the wontons. 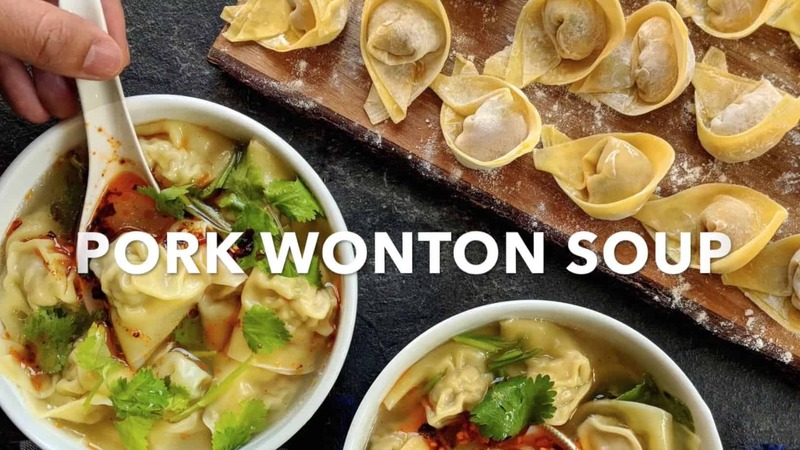 I like using home-made chicken stock as soup for this pork wonton dish. Just add a little salt, ground white pepper and a dash of sesame oil, then garnish with some chopped coriander leaves. If you enjoy spicy food as I do, some Chinese chilli oil will give the dish an extra kick. Mix pork mince, spring onion, ginger, soy sauce, Sichuan pepper and salt. Swirl constantly in the same direction while pouring in 4 tablespoons of chicken stock little by little until no liquid can be seen. Wet two neighbouring sides of the wonton wrapper with your finger tip. Place some pork mixture in the middle. Fold the wrapper into a triangle. Seal the edge. Then draw two corners together and press to seal (see video in the post). Repeat to finish all the wrappers. Bring a pot of water to a boil. Gently slide in wontons. Move them around with the back of a spoon to avoid sticking. Cover with lid . When the water starts boiling again uncover and leave to cook for a further 2 minutes or so. Drain and place wontons in serving bowls. Pour in hot chicken stock. Season with white pepper and salt if needed. Garnish with coriander. Add some homemade chilli oil if you’d like to spice it up. Make in advance: Freeze the wontons right after assembling. Cook them the normal way without defrosting. Thank you for reading my post and recipe. I hope this pork wonton soup provide a little extra warmth to you on cold days. Thanks Heddi! Look forward to your feedback. Have a great week ahead!